We sit down with Artspan's bestselling jewelry artist, Aileen Ca ral, to learn the secrets of her craft and of her success in selling her work. “Sea Glass is really just discarded bottles and tableware, or glass from shipwrecks and household items lost in natural disasters. Mostly it's glass that people carelessly threw into the ocean some 50 to 100 years ago, which has tumbled in the surf for years and has washed up on the sand looking like a little gemstone.” Aileen Cabral turns yesterday’s castaways into small treasures, lovingly setting each piece of sea glass according to its shape and character, and creating jewelry alive with personality, memories and color. She has turned life-long love of sea glass into an “immensely successful” business, and she seems to be having a lot of fun in the process. You work in “precious metal clay.” Can you tell us a little bit about it, what is it and how do you use it? Precious Metal Clay (PMC) is made from pure silver particles, mixed with a binding compound and water. It’s not really clay, but it looks and feels like it. It’s really just pure silver. You can form it, shape it, roll it out, stamp it, press it into molds. You fire it in a kiln to burn off the water and binder and it’s 99.9% solid silver. PMC is so versatile! It allows you to make things you never thought you could. It’s super fun to “play” with and I come up with new ways to use it all the time. A compass rose pendant. "I can hardly keep these in stock, people just love them." You seem like the ideal (but rare) combination of talented craftsman and clever entrepreneur. Can you give us some tips on attracting traffic to your site and marketing your work? Do you have any advice on using social media such as Facebook or pinterest in getting your work out there? I have found Facebook to be the ultimate marketing tool. I am currently running an advertisement on FB, called targeted advertising. I worked with FB’s ad department and developed an ad that they send to my targeted groups. I have gone from 1400 followers to over 11,000 since July 2014. Handcrafted jewelry is perfect for this type of marketing. I put a picture of a piece of jewelry on my FB page everyday and I add a link to my website. I’ve been selling my jewelry like hotcakes ever since. 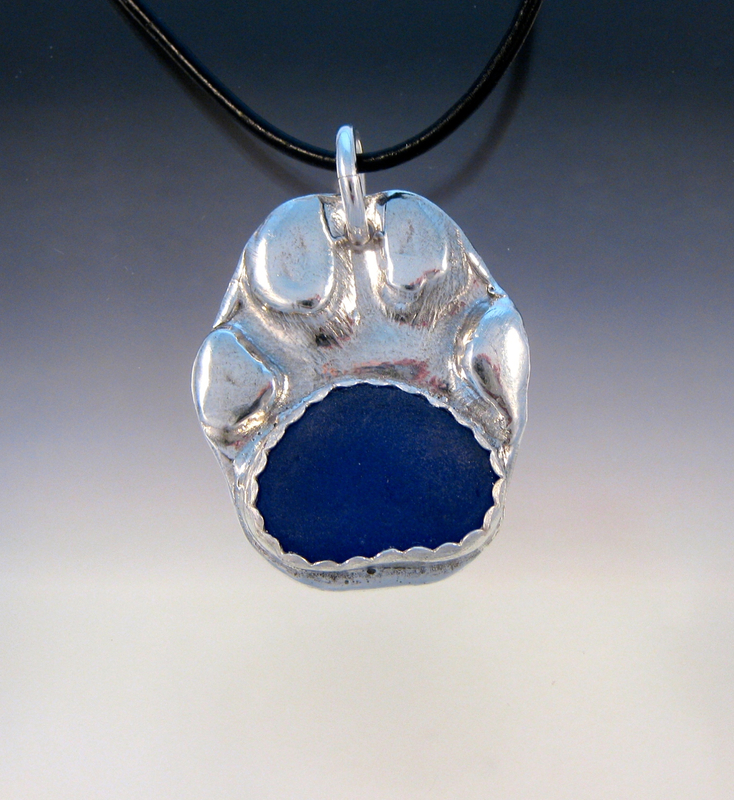 A paw print pendant. "Some years ago I made a mold of my dog's paw print. Someone wanted a paw print pendant and I aim to please. I have made dozens of these now. I engrave the back with the pets name. I have made them for dogs, cats and even a pair of ferrets." Do you have a memory of hunting for sea glass as a child? Where do you find your sea glass now? I see that people do commission you with their own sea glass, tell us about this? Honestly, my childhood memories are all beach. We lived about 15 minutes from the beach and spent entire summers going to Zuma, Venice and Santa Monica Beaches. I find my sea glass up and down the coast of CA. A lot I find right nearby my home, in Oxnard. I’m fortunate to live on Channel Islands Harbor, with many great beaches within just a few minutes. As far as commissions, that’s a really special thing to me. Someone is trusting me with a special memory of theirs and I get to make something great for them. I’ve made memorial pieces for quite a few people - some are family, some pets. I made about a dozen pieces for a lady, out of her mother’s sea glass collection. She gave them to her sisters and mother’s friends. I’ve got lots of stories about commissioned work. The great thing about sea glass is it’s a very personal item. You found it, you didn’t buy it, and it’s really special to a great many people. Sea Glass hunting is a scavenger hunt, every time you go to the beach. 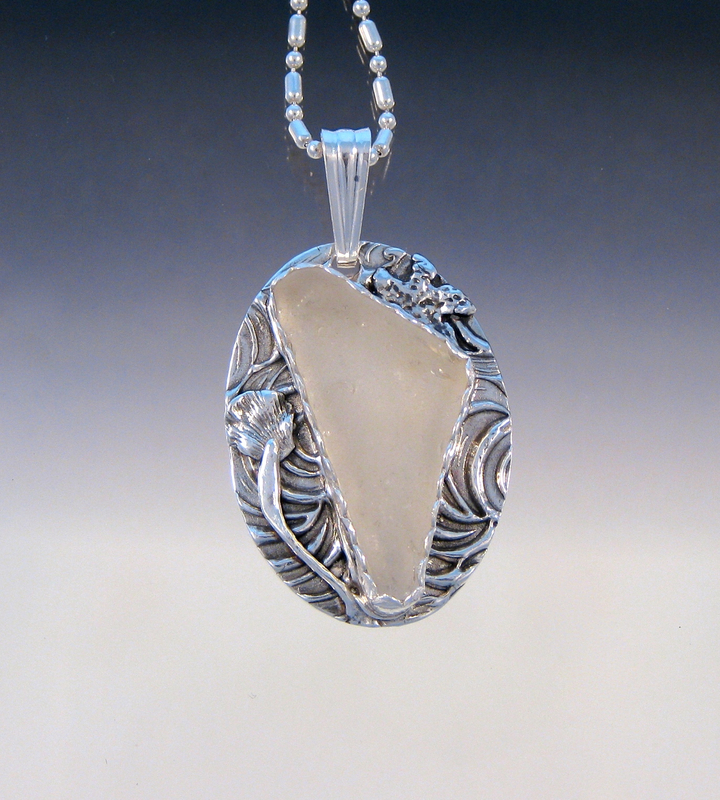 This piece was commissioned by a twelve-year-old girl for a piece of sea glass that she found. "Its the first and ONLY piece of sea glass she’s ever found. She really wanted a pendant, and I wanted it to be something unique and special for her. She absolutely loves it. I don’t use a lot of white sea glass in my designs, but in this case, I was able to create something super-special." 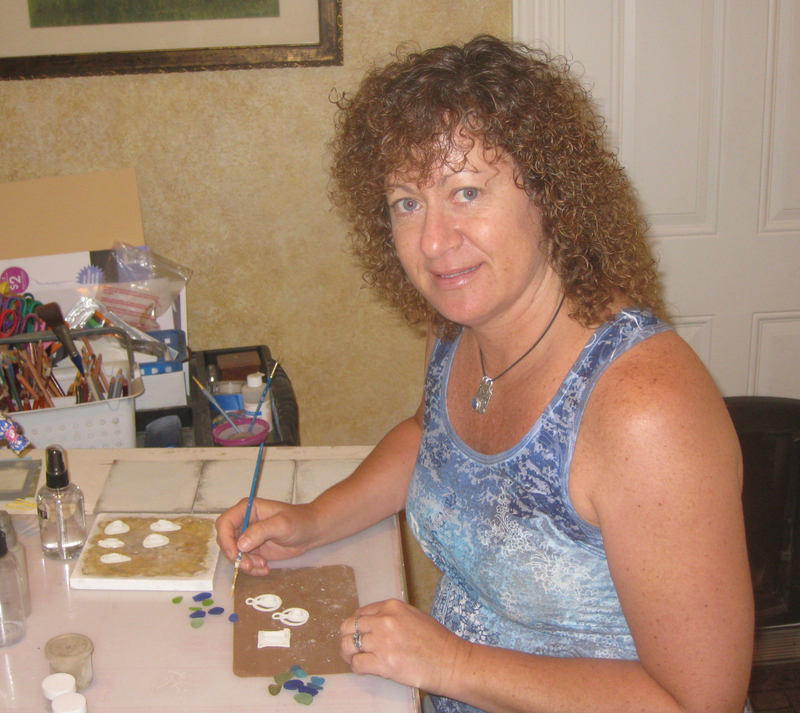 "I take vintage buttons, make a mold and form the PMC in the mold to re-create the button. This button was sent to me by my customer. It was her Grandmother's Button. It had a very special meaning to her. She had me make 2 pendants from the mold and gave one to a close friend. My friend, Kim, got me into this whole vintage button kick. She has a collection of her Grandmother's buttons and we made molds out of a bunch of them one night - now I have an entire gallery dedicated to vintage button jewelry. One of my best sellers." I love the idea that sea glass is something that was once discarded and has now become precious. Does this factor into your designs at all? Do you think about where a piece of glass might have travelled when you decide how to set it? I set all my sea glass based on the shape and what I “see” in the glass. I don’t cut, tumble or change the pieces in any way. The piece of sea glass pretty much tells me what it should be. Some pieces are heart-shaped and must be set in heart pendants. So I make the piece based on the sea glass. 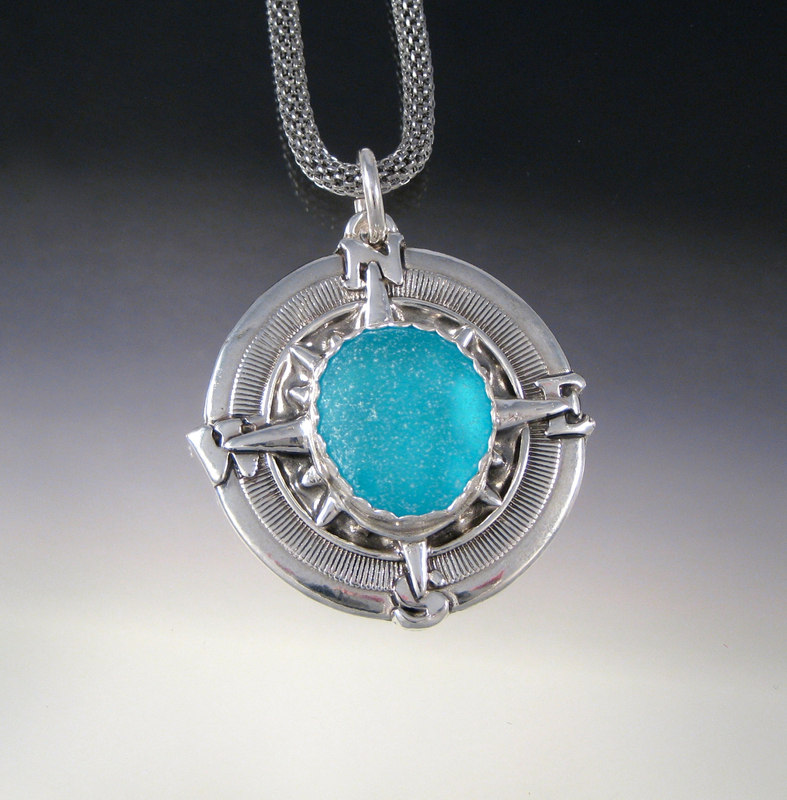 I rarely chose a piece of sea glass based on the pendant design. You were featured on a Travel Channel show. How did that come about? What was the experience like? That was super cool AND the start of my business. The travel channel was doing an episode on a sea glass hunt and they wanted a piece of jewelry made out of the sea glass they found. The guy that was taking them on the “hunt” recommended me, as he liked my designs best. They were filming in Northern Ca, so I had to bring everything there - we filmed at my friend’s house in Half Moon Bay. They filmed me for 4 hours. I made a piece of jewelry and taught Kirsten Gum (the host) how to make one. It was a bit nerve wracking, but they were really nice and it was a lot of fun. I ended up with about 45 seconds of air time, at the very end of the show. But the Travel channel linked my website to theirs and I got over 10,000 hits that first year. Some of my original customers are still buying my jewelry. I have quite a few “collectors,” who must have about a dozen pieces or more.